They’re not your typical band of high fantasy adventurers: Hannah the Rockabilly Elven Mage, Violet the Hipster Dwarven Fighter, Dee the Atheist Human Cleric, and Betty the Hippy Hafling Thief. These women are the stars of the new Image Comics/Shadowline series RAT QUEENS, and they’re the deadliest grog-guzzling, death-dealing, battle-maidens-for-hire in Palisade. 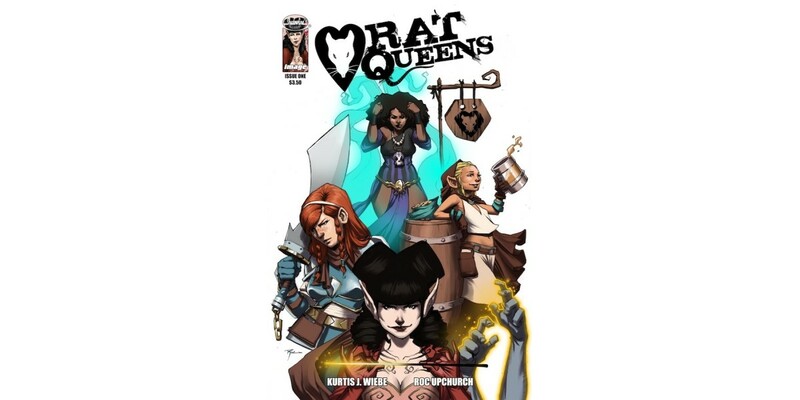 In this new series by Kurtis J. Wiebe (PETER PANZERFAUST) and Roc Upchurch, starting in September, the Rat Queens are taking on the quest of a lifetime… or at least the quest that’s going to get them out of the latest jam they’ve found themselves in: clearing out some pesky goblins from a cave. But these aren’t just any goblins, and Hindman Cave isn’t just any cave. Wiebe met his collaborator on RAT QUEENS, Roc Upchurch at Comic-Con in 2011. A RAT QUEENS webcomic by Wiebe, Dejmal, and Upchurch will run each week on the Image Comics tumblr until the release of the first issue on September 25. Wiebe has also spoken to the L.A. Times and USA Today about the upcoming series. RAT QUEENS #1 — including a special variant edition with a cover by SAGA artist Fiona Staples — can be pre-ordered now from the July issue of Previews (Diamond Code JUL130404:, one-in-ten Staples incentive cover: JUL130405).